A tiny world unfurls across your iPhone screen: the surface of a tranquil pond, where water beetles swim about, tadpoles wriggle to and fro, and turtles laze atop drifting waterlilies. But do not be deceived, beneath this soothing surface lies a cruel, Darwinian realm, where you must guide the tastiest of the Tasty Tadpoles ($1.99) as he attempts to eek out an existence. As a game, Tasty Tadpoles places itself firmly in the realm of the sort of one-touch controlled mobile experience first imagined in Angry Birds. You’ve seen this before: the cute cartoony characters, the colorful visuals, and those three stars to collect each level. . . So, after slinging birds for them, cutting ropes for them, filling buckets with water for them–is this latest three star scavenger hunt worth your time? In a word: yes. In Tasty Tadpoles, you must guide your intrepid little amphibian to the pond’s exit, dodging predators and collecting stars along the way. The game is played in portrait mode, with the entirety of the level displayed on your screen (though some later levels will buck this trend). 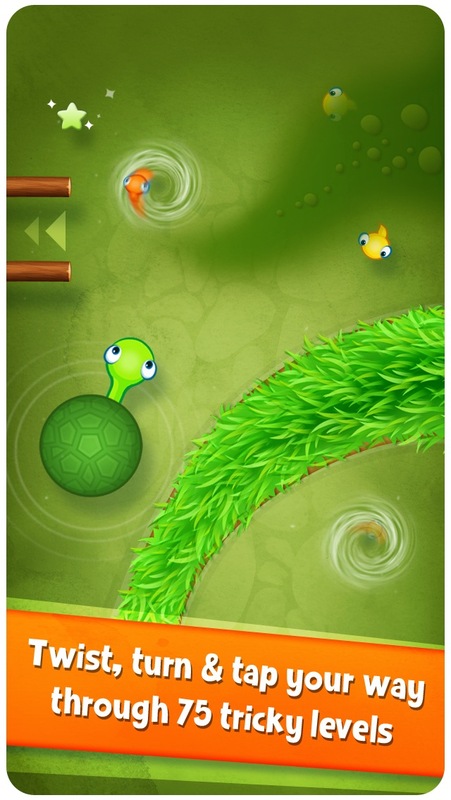 A single screen tap will send your tadpole darting on his way, or by dragging your finger you can create a more complex path. The stars must be collected sequentially, and only after grabbing each one will the next one’s location reveal itself. Between you and each star stands (or floats, really) numerous obstacles. Green tadpoles follow set paths around the level, yellow ones will track you if you make a sound, and near the end, dreaded red tadpoles will stalk you everywhere you go. 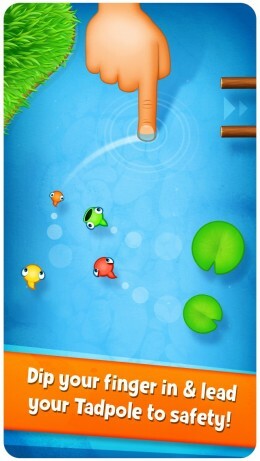 Eventually, you will be required to interact with the pond to aid your tadpole in his quest for those elusive stars. There are lily pads to be pushed, logs to be turned, snapping turtles to be stunned, and so on. Even the pond itself changes character: murky ponds obscure your vision and Amazonian ponds, overgrown with vegetation, provide hiding places from your would-be predators. 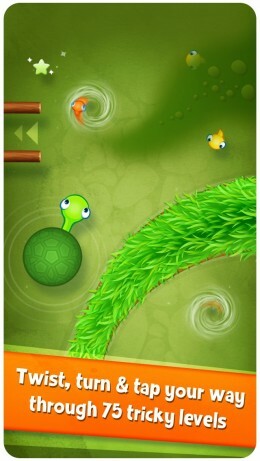 What really makes Tasty Tadpoles worth your time is its interesting fusion of gameplay styles. Yes, it has the mix of puzzlish elements, locked levels & unlockables, and challenges that we’ve come to expect from these sorts of games, but Tasty Tadpoles also introduces stealth to the formula. Some enemies only react to your screen taps, and by staying perfectly still you can avoid them. By dragging your finger your tadpole will splash about and make extra noise. 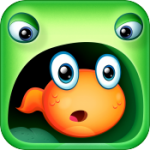 Some levels even require you to be noisy to complete them, such as using your splashes to lure a yellow tadpole to move a log blocking your path. In most levels, though, you want your tadpole to be as a ninja, using only a few quick taps to take him to the finish, grabbing the stars along the way. As I played through Tasty Tadpoles a sort of meditative calm overtook me. I’m sure the great accompanying music helped induce this trancelike state. On the more difficult levels, I found myself sitting there pondering the different potential paths, obstacles, and elements between my tadpole, the stars, and the exit. Once I’d figured it out, a few quick taps and it was over–either I’d gathered the three stars and was on my way or I’d become some cute little killer’s lunch. Unfortunately, a few blemishes disturb this title’s otherwise spotless surface. For a casual game which will often see you replaying a level over and over, the load times can be frustratingly long. Also, the main game is rather short, and though it has all the elements we’ve come to expect in these sort of three star affairs it still feels slightly skimpy. Experienced gamers should be able to complete the main game in an afternoon of play. Thankfully, a puzzle mode introduces a much greater challenge. In this mode you revisit the campaign but must complete the levels in a limited number of taps (no swipes here, folks) and it is a much greater challenge. Despite these problems, Tasty Tadpoles is worth your time. If you’re still unsure, you can always check out our first impressions for a different take, or see what people are saying on our forums. It’s just a great game to kick back on the couch and play. While contemplating your cute little tadpole’s path through the pond, you too will soon find yourself in an amphibian-induced trance. And you won’t even need to lick a toad.